Seal cracks and holes outside the home including entry points for utilities and pipes. Use hardware cloth to prevent wildlife from digging/burrowing into unwanted areas. Replace weather stripping and repair loose mortar around basement foundations, chimneys, and windows. Fixing a chimney entrance. Photo from Google Images. Roof vents. These are usually constructed of light weight aluminium or plastic, they are no obstacle for animals seeking entry into attics! Chimneys. If not screened properly, chimneys make suitable living quarters for raccoons, squirrels and birds. Birds can also fall into open chimneys and become stuck. These animals may even enter the "living space" of the home. Plumbing Vent Pipes. Unprotected plumbing vent pipes are an invitation to animals seeking den sites inside of a house. Animals can also become stuck in these pipes. Once inside the pipe, wildlife will obstruct the normal function of the buildings plumbing system. Stove & Bathroom Exhaust Vents. If unsecured, these make great nesting sites for birds and squirrels, resulting in noticeable sounds, odors and insects. Roof and Fascia Spaces. If these areas are not properly constructed, or begin to deteriorate, they offer an opportunity for wildlife to chew on the free edge of the wood and gain entry into the attic. Roof-Sofit Intersection. If left unscreened, this area can be easily manipulated by an animal from the outside in order to establish a den site inside the attic space. 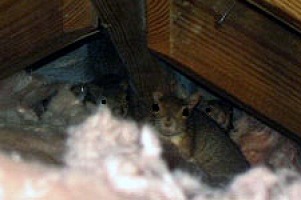 Squirrels living in a cozy attic. Photo from Google Images. To prevent squirrels from being/becoming pests: repair holes, install squirrel baffles on feeders, attach metal flashing around isolated trees next to your house to stop squirrels from jumping onto your roof. To stop cottontail rabbits from eating your plants: chicken wire fence around your garden or other areas, 18-24 inches high, stalked flush with the ground or buried a few inches; wrap hardware cloth 18-24 inches high around small trees, fold & bend the top so small birds cannot go in and get trapped. Make sure there is no way to enter your house. And don't forget about cat & dog doors! Do not feed or have food around. These animals will quickly learn that your house=food. If you consistently leave out food, and then forget one night, animals may break in to find the food they know is within! Secure all garbage extremely well! Once they learn that they can get into your garbage they will do so again, and again, and again. And we love the Humane Society of the U.S.'s Find Answers to Wildlife Problems page. ​If you want to hire a professional for help dealing with wildlife conflicts and solutions, make sure you find a reputable person who uses humane, non-lethal techniques, and who are sensitive to wildlife behavior and birthing seasons. As previously mentioned, you do not want to remove “the problem” without solving “the problem.” You also do not want to create orphan wildlife by destroying or relocating the mother animal. Make sure you ask any company how they perform their services to make sure they use humane methods. 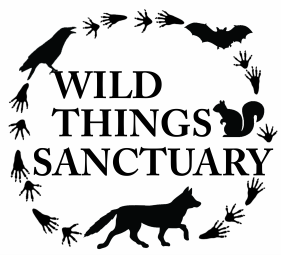 Check out our Resources: Living with Wildlife page. NB: before you take any measures to deal with wildlife, check with local and state government agencies (e.g., animal control offices; in NY, The Department of Environmental Conservation; etc.) for regulations pertaining to wildlife. Some states have strict policies and penalties for handling, or “harassing,” wildlife.